This picture is one of my favorites from this month’s escapade in Paris. It was taken at one of the top pastry/confection shops in Paris, Jacques Genin, which I was very happy to find to be just a matter of blocks from the apartment I rented in the Marais. And it was taken at a Sunday lunch I enjoyed with my sister. Not dessert after lunch. But FOR lunch. We each got our own from among the few millefeuille options on the menu, her vanilla, me praline. I love this image because it represents such a delightfully decadent moment, the beginning of one among many memorable afternoons we shared in Paris before she headed home. But after the last crumb was plucked up from the plate, the culinary pro in me felt a lingering impression made by the pastry as well. I realized that the dessert so easily expressed one of the simplest yet most valuable lessons I learned while at La Varenne a couple decades ago. Basically, there’s little flavor in “golden brown.” Rather than a pale, soft straw-color at which many might be tempted to pull these sheets of puff pastry from the oven, pastry chefs here go that extra stretch of time until the pastry is notably and evenly browned. As it should be. So, I fell for it too, that outdated idea that golden is universally the baking benchmark. In fact, it’s brown that often holds the gold ticket where flavor’s concerned. And not just baking, it’s true for caramel as well. If you cook the sugar mixture to the aforementioned golden brown before adding the cream or juice or whatever’s going to halt the cooking, you’ll have a nice, sweet, subtle caramel flavor. But if you take it beyond to mahogany-chestnut in color–to a nerve-wracking point when light wisps of smoke just begin to drift from the surface, then you’ll have a caramel that had deep, complex, nutty-malty flavor. I really didn’t mean to go all deep and philosophical and analytical about this insanely delicious and decadent pastry. Thankfully I just enjoyed it at that moment. But after the fact, while the butter and hazelnut-praline and cream and other decadent flavors still lingered, I began thinking beyond the plate to the memories of culinary lessons past that were being fed at the same time. At LV Anne was always chiding the students about ‘anemic’ pastry, and how right she was. The toasting of the flour in a butter pastry makes all the difference in flavor. 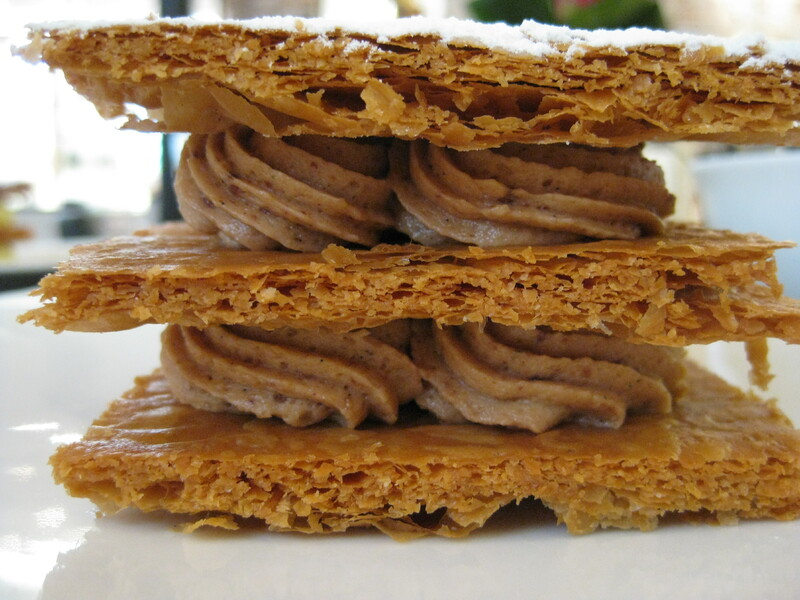 It’s wonderful to taste a millefeuille cooked to a tan complexion! And even Anne would hold her breath when I caramelized apples for my Tarte Tatin – mahogany caramel has more depth, as you say, but also it is less sweet. I made mahogany Italian meringue yesterday. Hope you can try it before you leave Paris! Commelisbonne. 37 Rue du Roi de Sicile We have just returned from two weeks in this area. We loved to stop for a small tart on the way back to out apartment to keep us satisfied until we could pour the wine, slice the bread and plate the cheese ! Really a disappointment when they had sold out .